In our last article we discussed what Actions in Photoshop were and we had a look at the Actions that come with Photoshop as standard. 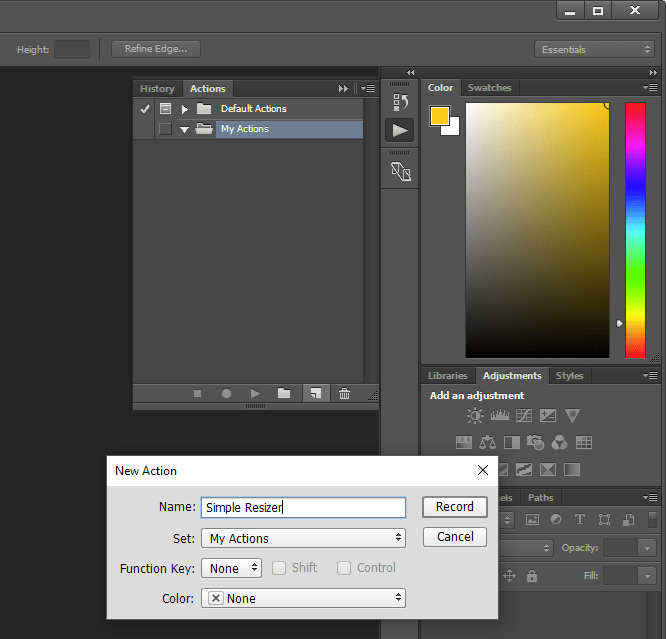 Now we’re going to have a look at creating our own batch image resizing Action. For this article I’m using images taken from http://unsplash.com but you are free to use any images you like. All of these images are over 3000 pixels wide so let’s resize them as a batch down to match our screen resolution. Mine is 2560 x 1440. To find out yours really easily quickly visit this site http://www.whatismyscreenresolution.com/. First, let’s open one of our images. Make sure you have the Actions window open (Alt+F9). I’ve closed the Default Actions set here just to make it easier to see what we’re doing. Now you want to click on the New Set icon to create a new set (basically a new folder). This isn’t absolutely necessary, but it helps keep things tidy. Action Sets or folders if you prefer allow you to stack multiple Actions that will run sequentially, so if you had a batch of images that you wanted to quickly convert to black & white, resize and then save to specified folder, you could have all of those Actions in a set and you could then have that run with just one button press (rather than doing the 3 actions separately). You can still run the Actions separately within a set of course. You will notice that you can also set keyboard function shortcuts to make it even easier to run an Action, but we’ll leave that for now. You can also ignore the colour as well. Now the fun starts! Hitting the ‘Record’ button will start the Action recording process and everything you do within Photoshop from that point onwards will be recorded, so it’s very important to know exactly the steps you’re going to take. With our example our steps are very easy. You have successfully created your first Action! Now we need to apply the Action to our other images. Let’s close our image now and not save the changes (you could, but we’ll be running the Action on the same image next anyway). From the File menu, go down to Automate and then Batch. In here you can set the Action to Play as the Set we created and our Simple Resizer Action. The Source Folder will be wherever you saved your images (alternatively, you can open all your images first and then choose the Opened Images option). Next you’re likely going to want to set the Destination to a new folder, just so that if you need your originals, they’re not overwritten. For this article, I’m going to use Save and Close, because these images are just going to be used as Desktop backgrounds, thus I don’t need the originals. That’s it. Click OK and the Action will run. 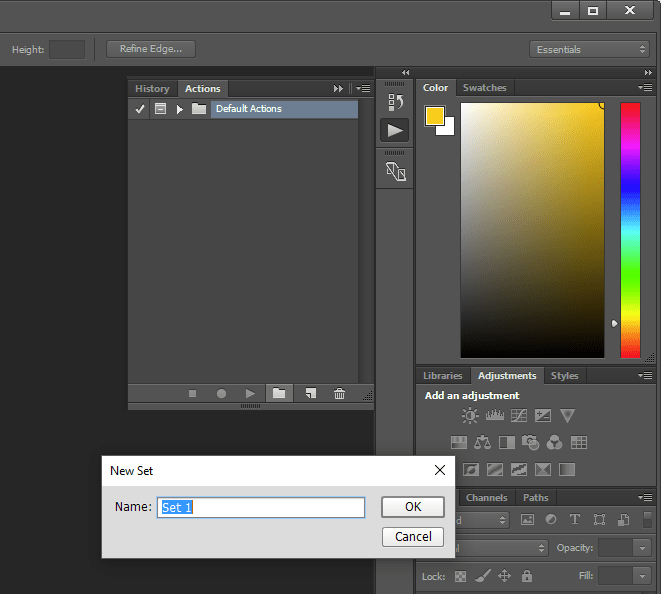 Now, you’re going to find that for each image Photoshop runs through, it’ll popup and ask you to set your JPEG options. This is fine, you can just go through and hit OK each time. You could set up another Action which would automate the save process which would make this even faster. Perhaps you can try that one yourself! And that’s it! Your very first Action! 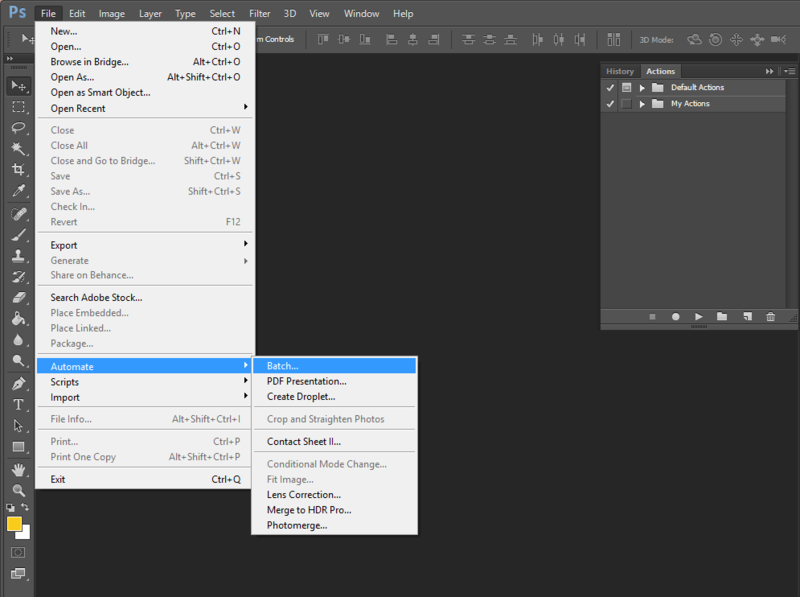 ← Previous Previous post: Photoshop CC: Actions (Part 1) – What are actions and how do you use them? Next → Next post: Has my WordPress site been hacked?